Have you chosen to remove your own tree and need us to get rid of the rest? Has your tree died and you are needing to get rid of the stump? Whatever your needs are for stump grinding and removal, we are here for you. Call us today at 806-472-4446 or fill out the form on this page today. Should I Stump Grind or Remove my Stump? Stump Grinding and Sump Cutting: Reduces the stump down to not being visible. We use a special tool that cuts down the stump down to nothing. 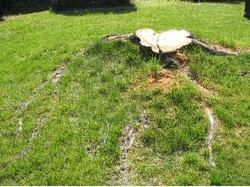 Stump Removal: We will literally remove the stump with roots and all. Let us show you the beauty this can add to your lawn. Whatever your stump wants, we will cut away or remove the stump the way you want it and when you want it. Let us get rid of your stump. Let us take care of your trimming services, no matter what you need.